High-Def FAQ: Why Don't the Black Bars Go Away? Editor's Note: As part of his new bi-monthly column here at High-Def Digest, from time to time, Josh Zyber will be answering frequently asked questions related to High-Definition and both HD DVD and Blu-ray. First up: Josh's illustrated answer to one of the most common questions asked by newcomers to the wonders of High-Def. It's been a good decade since the DVD revolution first started. In that time, the fastest-growing, most popular home video format on Earth has been overwhelmingly supportive of the concept of Original Aspect Ratio. In laymen's terms, that means displaying movies in the proper shape in which they were originally presented theatrically. Boiled down to its simplest explanation, not all movies are photographed to look the same as one another, and that's why some will fill a TV screen while others are encoded with black bars. The new generation of High Definition video discs have likewise carried on with this mission. And yet, despite 10 years of getting used to the idea, a common misconception still persists that the black bars are a flaw of the DVD format, or some sort of incompatibility with older televisions, and that upgrading to an HDTV and either the HD DVD or Blu-ray formats will somehow "fix" this problem. 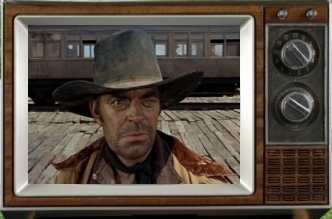 To this day, a great many people, upon buying their first HDTV, believe that since the set is "widescreen" that now all movies should automatically fill that screen. When that doesn't happen, some then assume that the issue is caused by the lower resolution DVD format. Now that we're watching movies in "High Definition," shouldn't Blu-ray or HD DVD rectify this by perfectly matching up with a High Definition television? Again, that turns out to not be the case. High Definition in fact has nothing at all to do with the shape of the movie. To clear up this matter once and for all, I'd like to offer the following visual explanation for why movies are the shape that they are, and why the black bars will not and should not ever go away. At the dawn of the motion picture era, there was no single standardized aspect ratio for silent films. Depending on the camera used, some were a little wider or a little narrower than others, but all were roughly squarish in appearance. Eventually, a standard emerged, known as Academy Ratio. 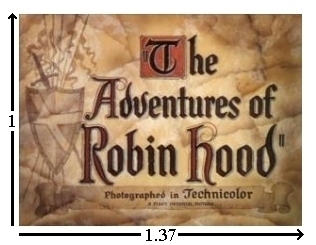 Films of this type measured at an aspect ratio of 1.37:1, which means that the picture was 1.37 times wider than it was tall. All things considered, this still looks basically square. 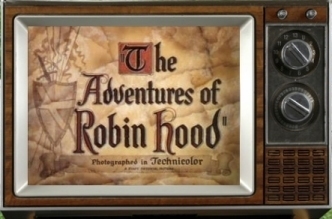 When television came along, it emulated the movies and gave us a screen with an aspect ratio of 1.33:1 (also expressed as 4:3). The difference between 1.37:1 and 1.33:1 was insignificant, and generally speaking this made for a pretty good fit. Keep in mind that the explanation I'm giving here has been simplified to its most basic concept. Reality is of course more complicated. Almost all consumer televisions have some degree of overscan, causing the edges of the picture to be masked behind the frame of the screen. For the time being, let's just stick to the general principle. The cinema being a highly creative art form, the notion of a standardized frame ratio didn't stop filmmakers from experimenting with different screen shapes. As early as 1927, Abel Gance shot portions of his epic 'Napoleon' with the intention of projecting three strips of 35mm film side by side, for a ratio of approximately 4:1. Jumping forward to the 1950s, competition from television drove the film industry to begin the move away from Academy Ratio in favor of new, wider screen sizes in order to give audiences a larger, grander experience than they could get at home. Since human peripheral vision sees more on the left and right than on the top and bottom, a wider frame allowed movies to become more immersive, especially on very large theater screens. Rather than settling on a single new standard, two very different aspect ratios came to dominate movie theaters. Although a number of variations have also appeared over the years, theaters to this day are equipped to project in the following two shapes, with adjustable width or height masking to accommodate both when alternating between movies of each type. This has worked out fine in movie theaters, but clearly causes a dilemma when the films come to television or home video. Like those shape toys we all played with as toddlers, a rectangular block just doesn't fit into a square hole. Something has to give. Unfortunately, the solution most commonly used for decades was to simply slice off the sides the movie image in a process known as "pan & scan," and cram what was left onto the TV screen. 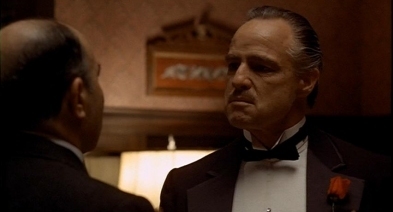 This can have a devastating effect on the film's photography, especially on Scope pictures. Close to half of the original image was lost, frequently making scenes difficult to follow. 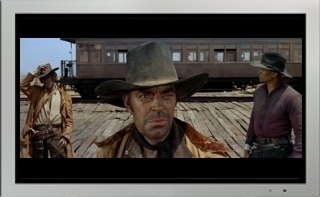 In this example from 'Once Upon a Time in the West,' we've lost two whole characters from the shot. This was far from an acceptable result, yet the practice of pan & scan persisted for many years as movies were presented on broadcast television and VHS. Thankfully, during the laserdisc heyday of the late '80s and early '90s, an alternative was developed. 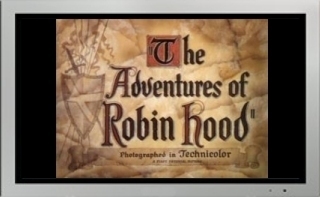 In the process known as "letterboxing", the wider movie picture was reduced in size until the entire width fit on a squarish TV screen, and the empty space above and below was filled in with black bars. Contrary to common misperception, the black bars are not covering up part of the movie. They simply fill in the unused space on the TV screen. Obviously, this is a compromise and has a drawback, in that the picture is now smaller and less detailed. Still, at least now the entire image is there. If we have to compromise, this was certainly a better trade-off than pan & scan, and we are all fortunate that DVD (and now Blu-ray and HD DVD) followed suit and also widely adopted letterboxing to preserve the Original Aspect Ratio of each movie we watch. A new century is upon us, and the way we watch television has evolved from the boxy sets of old to shiny new High Definition TVs, which not only provide a better quality picture but are also designed in a widescreen aspect ratio. The 1.78:1 (aka 16:9) shape of an HDTV set is a very close match to the Flat theatrical ratio of 1.85:1. The difference between these two ratios amounts to only a few scan lines, which are usually hidden by the overscan on most consumer TVs anyway. Now we have a nicer option of watching movies in their Original Aspect Ratio with a bigger picture and without so much wasted screen space. But we're left with the problem of Scope films, which means that letterboxing is still needed for some movies even in High Definition. Fortunately, the compromise is much less severe on an HDTV, so the 2.35:1 movie image is larger and has smaller black bars. Interestingly, the move to widescreen HDTV has left us with a new dilemma about what to do with old Academy Ratio movies that weren't shot in widescreen. 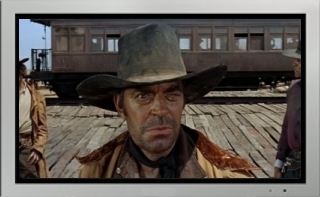 The solution in this case is called "pillarboxing" and involves black bars placed on the sides of the movie image rather than the top and bottom. Why Do We Need More Than One Aspect Ratio? A frequent question of new HDTV buyers is why we have so many aspect ratios in the first place. Why doesn't the film community simply unite behind using the Flat ratio of 1.85:1, which will nicely fill an HDTV screen so that we don't ever have to deal with black bars again? The answer, to be blunt, is that movies are made to be seen in movie theaters, not on TV. 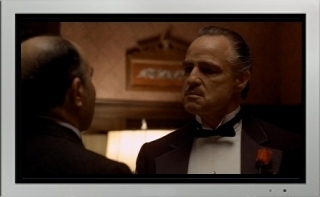 The choice of aspect ratio is an artistic decision made by each filmmaker. Some movies are better composed for 1.85:1 and others for 2.35:1. You might as well ask why all painters don't use the same size canvas or why all music isn't played in the same key. Consider two films by Steven Spielberg. The director shot 'Jaws' at 2.35:1 to showcase the vast expanses of open water in the ocean. Yet he shot 'Jurassic Park' at the narrower 1.85:1 ratio to emphasize the height of the dinosaurs. These were two different movies with two different artistic goals, requiring the use of separate aspect ratios. Is Cropping to 16:9 Really So Bad? At this point, you may be wondering how movies broadcast on the High Definition cable and satellite channels manage to fill an HDTV without letterboxing. The answer is that Scope movies are typically either cropped through the pan & scan process or presented "open matte" (more on this below). As we can see from the examples above, chopping a 2.35:1 Scope picture to 4:3 loses almost half the original picture. But cropping from 2.35:1 to 16:9 is a much smaller change. Is that really such a big deal, many will ask. Isn't all of the "important" picture still visible? 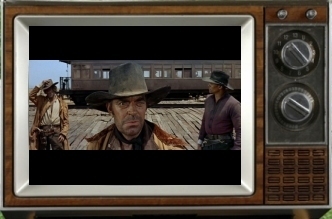 Looking at 'Once Upon a Time in the West' again, sure some picture is missing, but we can still tell that there are two guys in the background. Isn't the guy in the middle supposed to be the focus? And how many movies really place "important" picture information at the far edges anyway? Most of the picture is there. Isn't that good enough? Frankly, no. Photographic composition is an art form. 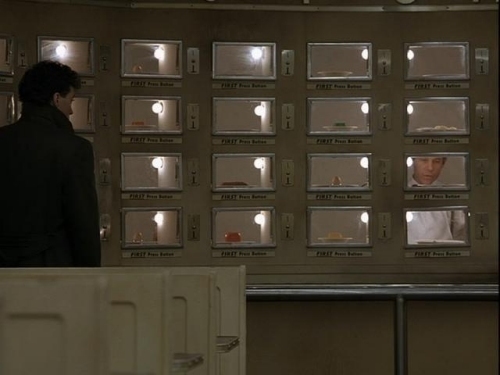 The filmmaker and his Director of Photography use the entire frame and the position of characters or objects within it to create a sense of balance and perspective. The notion that some parts of the picture are more important than others is a fallacy. In this famous shot from 'Lawrence of Arabia' (photographed in 65mm at an aspect ratio of 2.2:1), you might say that there's a lot of empty room on the left that we don't need to see, but that would miss the point of the shot. Director David Lean carefully uses negative space throughout the frame (on the sides, in the expanse of sky above the characters, and at the horizon in the deep background) to place his characters in proper perspective against their environment. Losing even an inch of this would destroy the intentions of the shot. The Issue of "Open Matte"
To further complicate matters, adjusting an aspect ratio doesn't always require cropping picture off the sides. Sometimes it involves the exposure of additional picture on the top and bottom of the frame. Many movies are photographed in a manner wherein the entire 1.37:1 film negative is exposed to light, with the intention that parts of the top and bottom of the frame will later be masked off with mattes to achieve the desired theatrical aspect ratio. Usually in these cases, the "full screen" (4:3) video transfer for television or DVD, or the 16:9 transfer aired on networks like HBO-HD, will remove the mattes and fill in the screen with extraneous picture that we didn't see theatrically. So is this a good compromise? We get to see everything the director wanted, plus more. Isn't more always better? 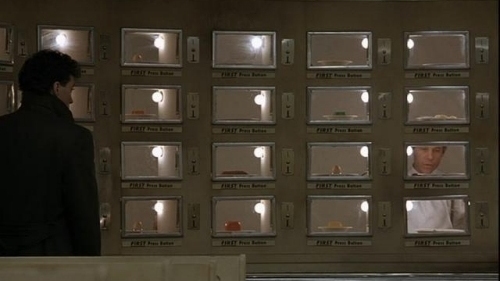 In this shot, director Alex Proyas has carefully positioned his characters at opposite ends of the frame, and uses the windows between them to form a precise geometrical symmetry. But here is what was actually photographed on the camera negative. The shot is now vastly different. We can see empty space above and below the theatrical area, as well as some benches that weren't visible before. This change in perspective has an immediate effect of making the characters seem further away from the viewer yet closer to each other, altering the psychological impact of the scene. Unlike the 'Lawrence of Arabia' example above, Proyas wasn't trying to use negative space in his shot. He wants to fill the frame with pertinent visual information. Opening the mattes ruins that. Even a compromise 16:9 framing still shows too much picture that we weren't meant to see, and loses much of the dynamic tension of the original composition. More is not always better. Usually it's best to just leave things the way they were meant to be. Filmmakers tend to frame their shots at a desired aspect ratio for a reason, because they have an artistic aesthetic that they're trying to achieve with it. The desire on the part of the home viewer to fill their TV screen is a matter of misplaced priorities. A television, even an expensive HDTV, is just a box. The purpose of the box is to display a movie image, much like a picture frame holds a photograph. If you have a frame that's too big for a photo, you use mattes to hold the picture in place and fill the empty space around it. That's exactly what the black bars do, no more and no less. In the final analysis, it comes down to a decision of which is more important, the picture or the frame. A TV screen doesn't need to be filled to perform its duty properly. The black letterbox or pillarbox bars help it to achieve its purpose. Black bars are not the enemy. They should not be feared. Even in High Definition, the black bars will never entirely go away, nor should they. See what people are saying about this article in our forums area, or check out other recent discussions. Got a question you'd like to see Joshua Zyber answer in a future column? Send it to us via our Feedback form.